FRIDAY THE 13TH @ PURE! > $25 AYCD! 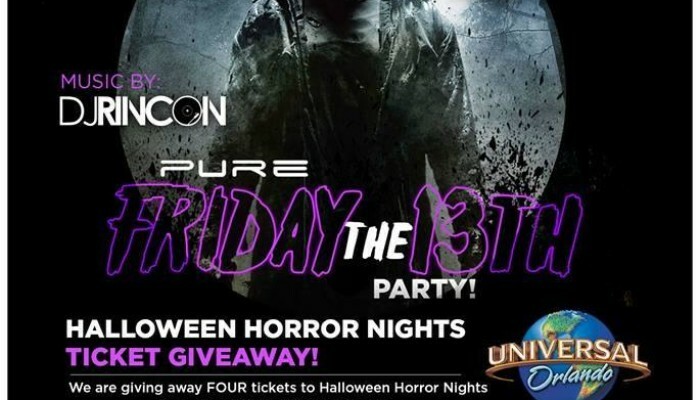 Jacksonville Events, Concerts, Nightlife & Nightclubs | FRIDAY THE 13TH @ PURE! > $25 AYCD! FRIDAY THE 13TH @ PURE! *Halloween Horror Nights Ticket Giveaway* $25 AYCD! Event Description: Friday the 13th Party at Pure! Guest List CHECK INs get entered into the raffle to win tickets to Halloween Horror Nights @ Universal Studios! Must be on the guest list & present to win! Also Introducing $25 AYCD ( All you can drink ) all night! Calls & Down! ❋✤ Chance to win tickets to HALLOWEEN HORROR NIGHTS!